In Coniston in England’s Lake District local newspaper journalist Tony di Venuto starts a campaign to re-open the investigation into the disappearance of a young woman, Emma Bestwick, ten years earlier. At the same time a man who knows what happened to her returns to the area and decides to tip off the journalist. This provides enough information for DCI Hannah Scarlett, head of the Cumbria’s Cold Case Review Team, to take another look at the case. Perhaps it’s because the audio books happen to be narrated by the same person but this book reminded me of the Shetland novels by Ann Cleeves that I’ve read. They have the same wonderful sense of place and combination of solid procedural storyline with fascinating local colour and historical details. In this novel the procedural elements of the story are deftly handled as, without much in the way of forensic evidence, Hannah and her team rely on their interviewing skills and a little bit of luck as they talk to all the people who knew Emma prior to her disappearance. It becomes clear for example that Emma came into a sizable sum of money but she told her sister it was a lottery win and others the money was an inheritance so the squad have to determine the real source of the money and whether or not it had anything to do with the disappearance. They must also delve into local history which includes a something of a feud between two families, the Cloughs and the Inchmores, which has had a significant impact on the area over time. It was an Inchmore who was responsible for the now abandoned arsenic mines that turn out to be such a crucial location for this story while what remains of the Clough family are now in charge of the quirky Museum of Myth and Legend which also proves instrumental to the plot. Hannah once again meets up with Daniel Kind, a historian and the son of Hannah’s mentor when she first joined the police force. Daniel’s research into local historical figure John Ruskin eventually provides an important link to part of the investigation. Their obvious attraction to each other, despite being in relationships with other people, is handled interestingly because it’s not simply a case of leaping into each other’s pants because they fancy doing so. I also enjoyed the depiction of Guy, the man who knows what happened to Emma, who is a serial seducer of women for their money. He’s a nasty piece of work to be sure but a compelling character. All in all The Arsenic Labyrinth is an above average example of the genre. 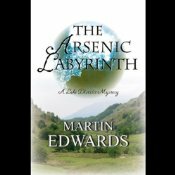 It is well-paced, particularly in the second half, has several satisfyingly unexpected twists and Edwards has generated genuine interest in finding out all the villager’s hidden secrets even if they end up having little to do with the overall mystery. I’m also impressed that the book can be easily read and enjoyed without having read the previous books in the series (I have read the first book but not the second) (yet). Gordon Griffin is fast becoming one of my favourite narrators (he has also narrated the two Ann Cleeves books I’ve listened to). His style and voice are well suited to the art of story telling and I can highly recommend this narration. You can read my review of the first book in this series, The Coffin Trail, or might be interested in Edwards’ foray into true(ish) crime Dancing for the Hangman. Martin Edwards blogs about crime fiction and writing at Do You Write Under Your Own Name? I also really enjoyed this book, and can’t wait to read more of the series. I hope Martin does not keep us waiting too long for Hannah and Daniel to get together. I have forgotten so much of this already. Wonderful really, because when I retire, I can just start reading all the old books on my shelves and enjoy them again. Now you mention Guy, I do remember thinking he was a really well-drawn character that one loved to hate. Enjoyed the review. Sounds like this would be a great book to listen to on audio. I haven’t read any of this series yet, but I am intrigued by it and looking forward to reading (or listening) to it. Lovely review, Bernadette. I think I’d find it hard to hold it all in my head if I “read” the audio version. I agree there are similarities between Cleeves and Edwards, as they both write “traditional” (I mean this in the best possible sense) stories set in the North of England, and they are both part of the same writers’ “collective” if that is the correct term. They are both excellent authors and I don’t understand why they aren’t best sellers compared with some far inferior fare that sell more. I too liked the character of Guy. Also I could be wrong but I like the way Hannah seems to be gradually taking a more central role in the novels and Daniel less so (comparing the trajectory of the first four)…as I like Hannah a lot. For what it is worth, I don’t think you “need” to go back and read the previous novel. In my opinion, this series gets better with each outing, and I don’t think you are missing anything essential by having skipped one. Of course, it’s a good read if you have got time on your hands — but you might find it more satisfying in terms of plot development to move on to The Serpent’s Pool. I really have to start on this series. I seem to be missing out on a lot by not reading it. There is so much to read of global fiction that I can’t quite get back to England or the U.S. or even Scandinavia–am reading Zoe Ferraris’ “City of Veils,” and also “Containment,” by Vanda Symon. And tons on my TBR list. Just put “A Darker Domain” at the top of the list when I get back to Britain, will put the first in this series at the top also, where I’ve got Jim Kelly’s new book, Kate Atkinson’s and a few others, not to mention so many good books RTR and Petrona have recommended. Where are our “So much to read, so little time” T-shirts? I’m very grateful for this review and also the comments. And, though I’ve been doing a little less blog posting and commenting recently, at least I’ve now nearly finished the next Lake District Mystery….As for The Arsenic Labyrinth, I did love writing about Guy. And yes, Hannah has become much more important than I intended when I set out on the first book. I was wary about having a female central character, but I’ve enjoyed exploring her mindset so much I’d like to focus more on female characters in the future.